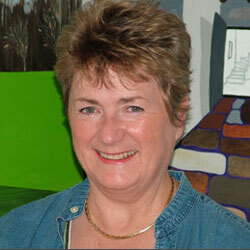 Angela Smith lives on the west escarpment of Dartmoor which inspires much of her work. Walking, sketching and studying the Tor-dotted landscape and soaking up the bleak, moody, windswept drama lit by ever changing moorland skies. Parts of her work are influenced by elements from wider travels and she experiments constantly with different mediums and techniques to reflect nature’s complexity and harmony. In her work colour and atmosphere are important elements. whilst shape and form dictate the emerging composition. She has exhibited overseas, but mainly in London, and accomplished some larger scale corporate commissions and murals.